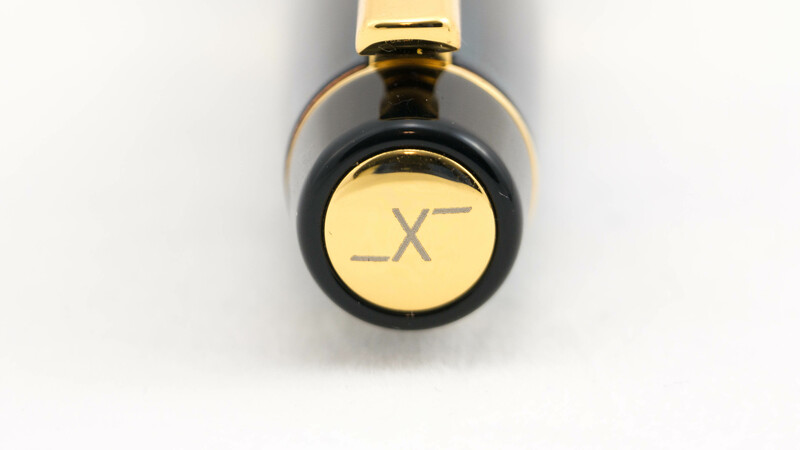 I’ve written/talked about Xezo fountain pens before on the blog and YouTube channel (see here, here, and here) so I won’t go into too much detail reiterating info about the company here. You can revisit those posts if you want a bit more information. 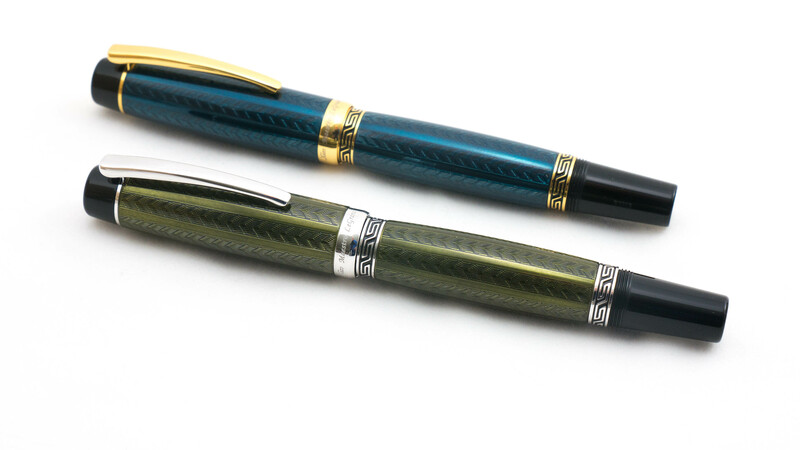 A few months ago, Xezo sent me a couple variations of one of their newest models, the Maestro LeGrand for me to review and give away to my pen friends. Xezo sent me two pens for this review. 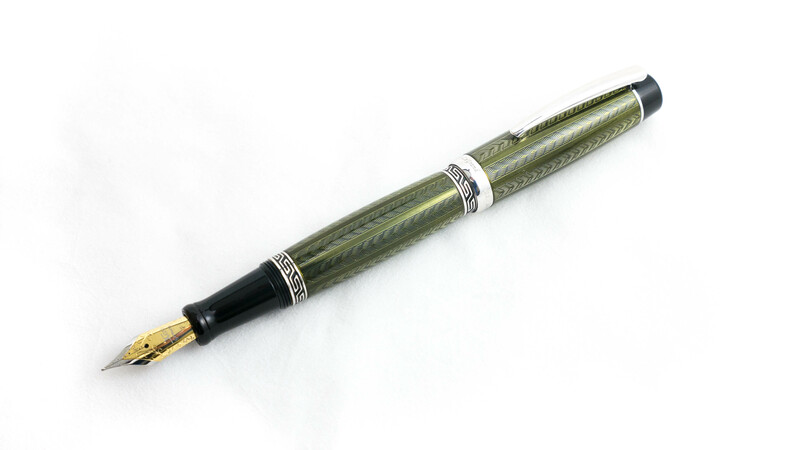 The Moldavite (olive-colored pen with silver trim) is meant to reflect the coloring of the mineral found in the Czech Republic. The teal-colored variety with gold trim is known as the Dioptase, and also reflects the color of the gemstone of the same name. 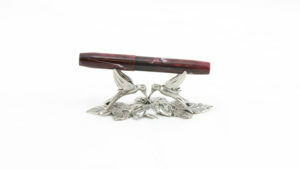 Both are limited editions of approximately 230 pieces. These particular models were introduced in 2017. 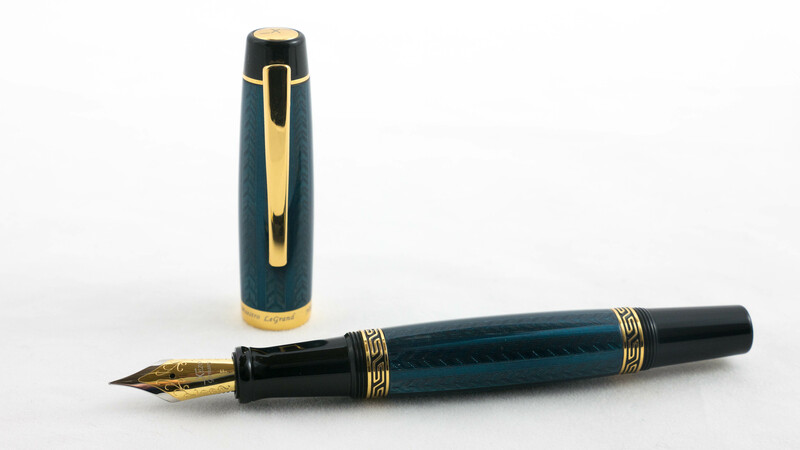 The Maestro LeGrand features a fairly classical profile, with a flat top engraved with the Xezo logo, a streamlined clip, and a Greek key design that circles the pen at the top and bottom of the barrel. 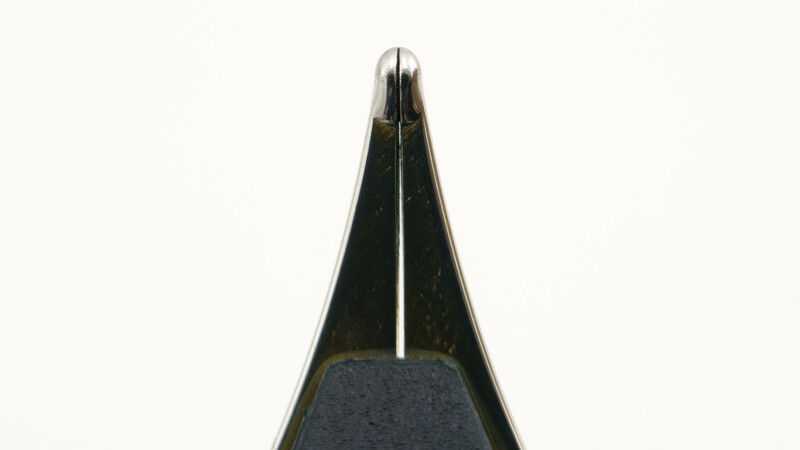 The pen features a long, flat, black finial with threads that allow for secure posting of the pen. 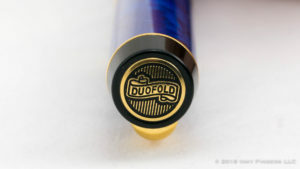 Both the barrel and the cap are first decorated with a diamond-cut guilloche pattern and then lacquered–first with layers of a translucent color then with several clear coats. Per the company’s description, each layer is dried and polished before the next is applied. 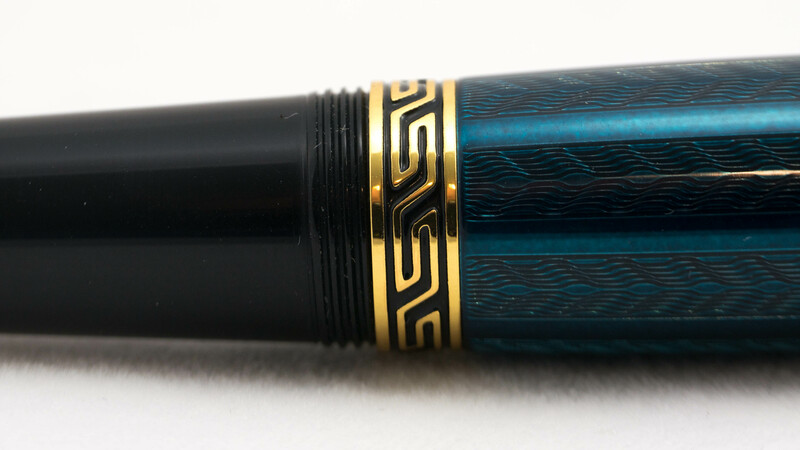 While the shape of the pen feels a bit chunky for my tastes, I do have to say that I love the guilloched lacquer work on this pen. 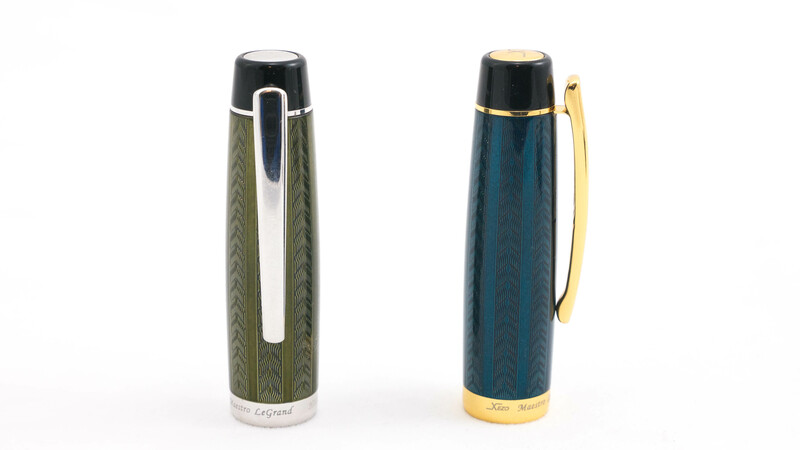 The colors are bright and rich, the engraving is sharp and crisp, and the whole thing has a silky-smooth feel to it. 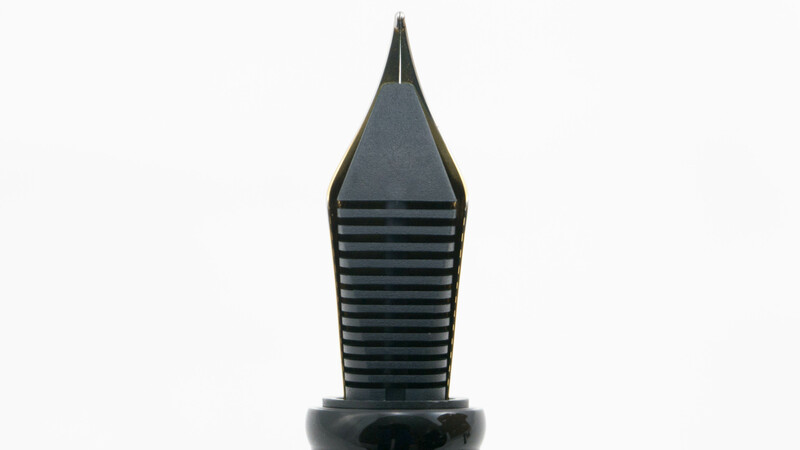 Under the cap, there is a long, black plastic section with a bi-colored #6-size nib. 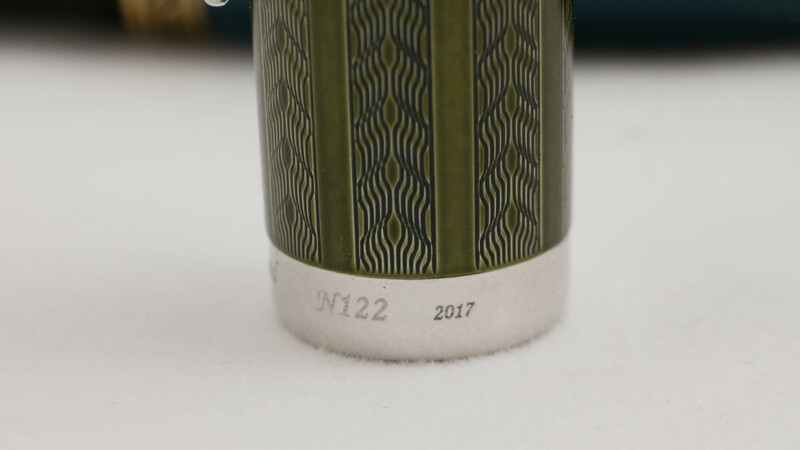 The Xezo name has been laser-etched onto the nib’s surface (rather than imprinted there at the time of manufacture) similar to what you see from other smaller manufacturers. If I had to guess based on the shape of the pen’s feed, these nibs are manufactured by Jowo. All in all, I find the construction quality of these pens to be superb. They’re rock-solid, built with tight specifications, and are finished well. The uncapping mechanism is smooth and even. The nibs on both pens wrote well for me out of the box. That being said, I’m not sure this is the pen for everyone. These are extremely heavy pens. 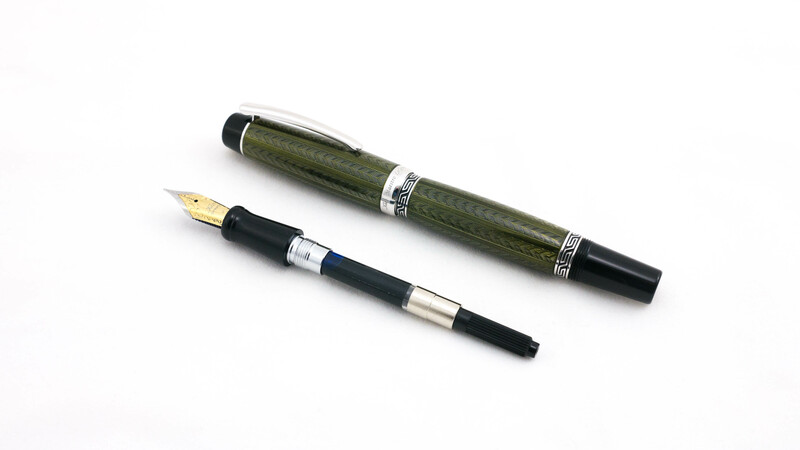 The metal walls which give the pen such a solid feel also give the pen a lot of heft. At nearly 40 grams uncapped, and a whopping 63 grams capped or posted, this is not the writing instrument for someone who likes a light acrylic pen. 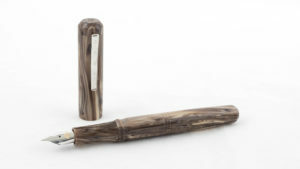 It’s also quite a large pen, with a slightly slender section in relation to the pen’s weight and girth. At only 10.5mm in diameter, the section is still comfortable for me, but does border on the slightly too narrow side. So, if you like a chunkier grip, bear that in mind. In the hand, I find the pen well-balanced and comfortable so long as it isn’t posted. 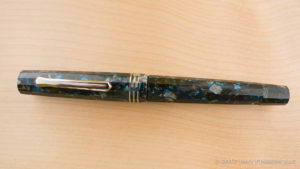 Posting this pen makes it far too long and far too back-heavy to be usable for me. Fortunately, as someone who doesn’t post his pens, that’s not a huge consideration. The nib is likewise well-adjusted. The ink flow was moderate, and I noticed only the slightest hint of ink starvation on longer writing sessions. (So little, in fact, that it could be entirely imagined.) The steel nib is as rigid as you would expect from a steel nib, and there was a touch more feedback than I generally like, although that may also be attributed to the ink I was using. 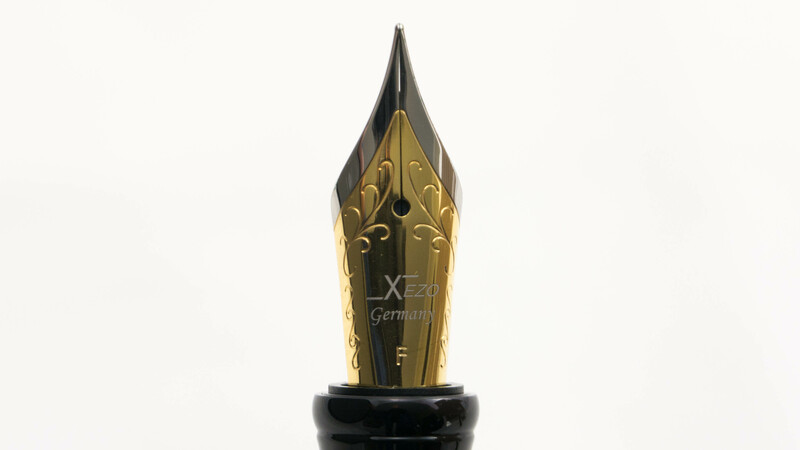 I do have a smaller bugaboo regarding the Xezo Maestro LeGrand: the company has chosen to offer only fine nibs on the pen. You can, after you order, send an email to request a medium nib, but that seems more difficult than should be necessary. 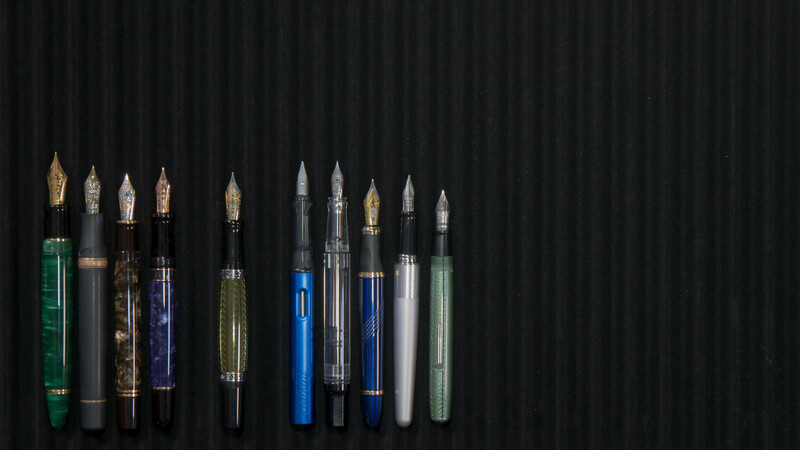 To really engage the fountain pen enthusiast community, it is my opinion that you need to offer XF, F, M, B, and 1.1MM Stub nibs at a minimum, although I can fully understand that keeping all the various nibs in stock for that kind of offering can be a bit of a hassle–not to mention a significant cost. 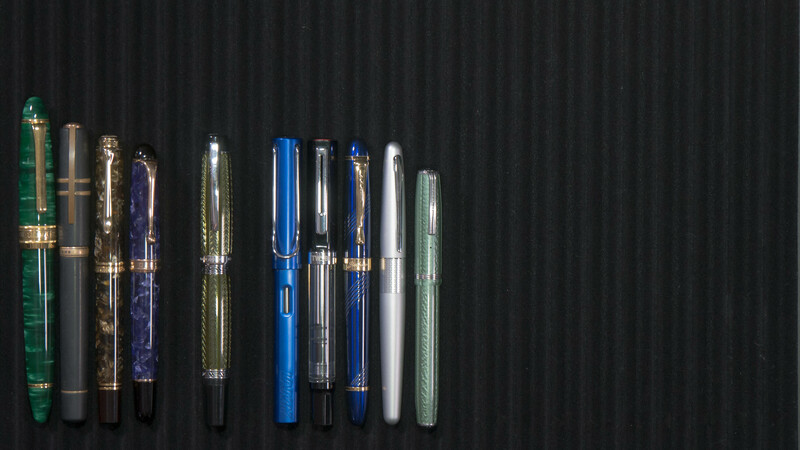 The decision not to offer additional nibs sizes makes me wonder if Xezo is choosing to target their wares for the non-enthusiast market instead. 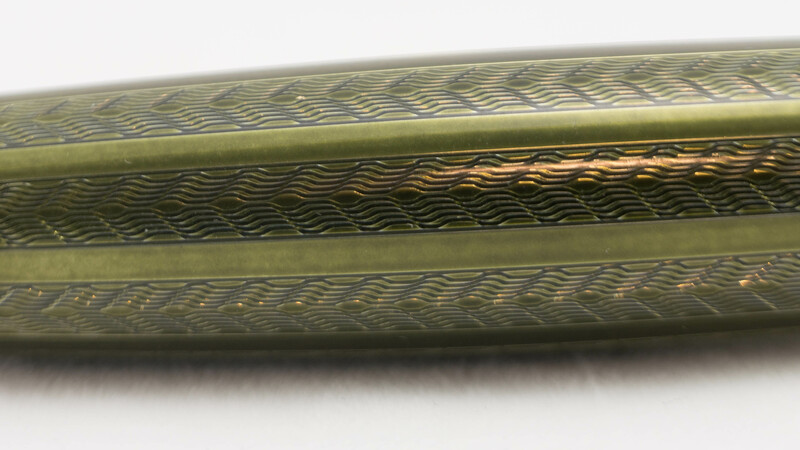 I think most non-fountain pen users tend to want fine nibs to more accurately replicate the ballpoint experience. Fortunately, as these appear to be standard #6 nibs, swapping nibs out should be relatively painless. In terms of price, the Xezo Maestro LeGrand prices range a bit depending on the model you get. The Dioptase lists for $170, while the Moldavite lists for $160. There is also a rollerball version for approximately $15-20 less. 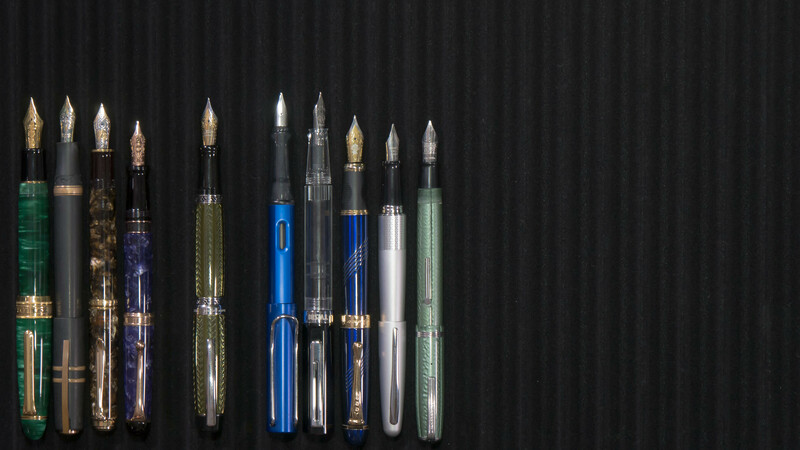 And, if you want a convertible pen, you can purchase an additional section to switch from fountain pen to roller ball for about $12. 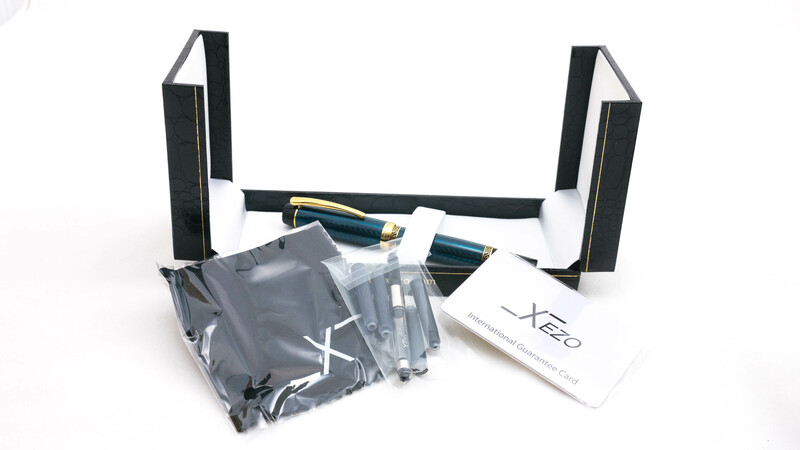 As far as I know, Xezo’s pens are only available from Xezo directly (they don’t seem to wholesale to other retailers) so any discounts or sales would have to come from Xezo. 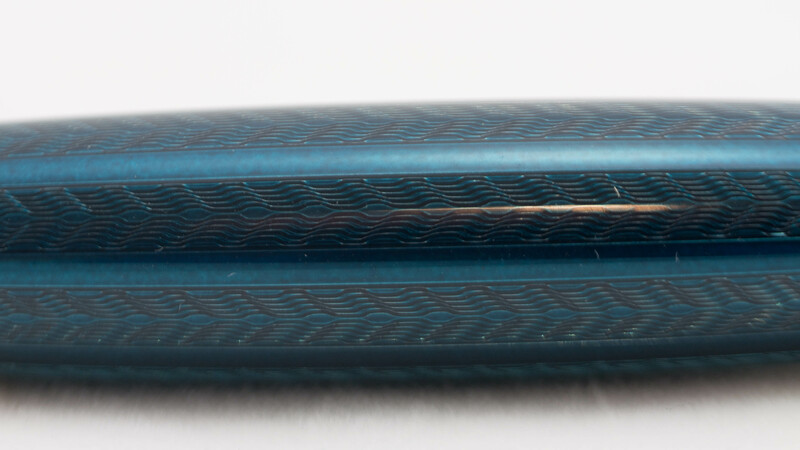 While the price feels a touch high for me (I have a mental block about heavy metal fountain pens feeling inexpensive due to my early experiences with a lot of very cheap Chinese-made pens), the construction quality, lacquer work, and guilloche are top-notch on this pen. 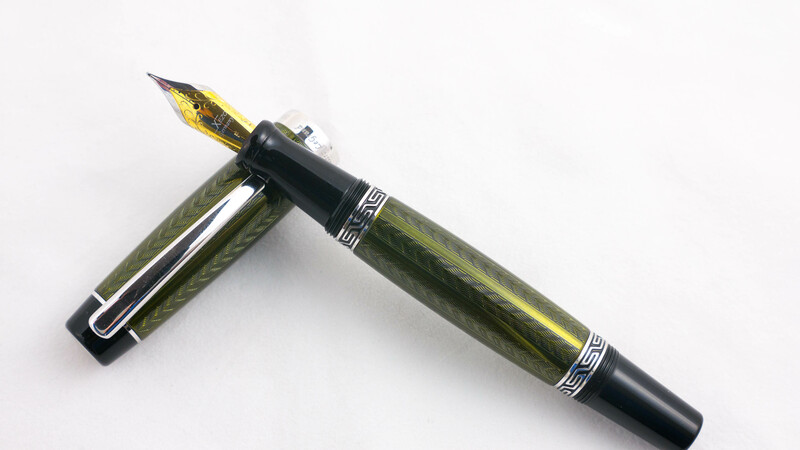 If you’re a fan of heavier pens or metal-bodied pens, I think this is one you could really enjoy. These pens were provided free of charge for honest review and giveaway. No other compensation was provided. All opinions expressed herein are my own. 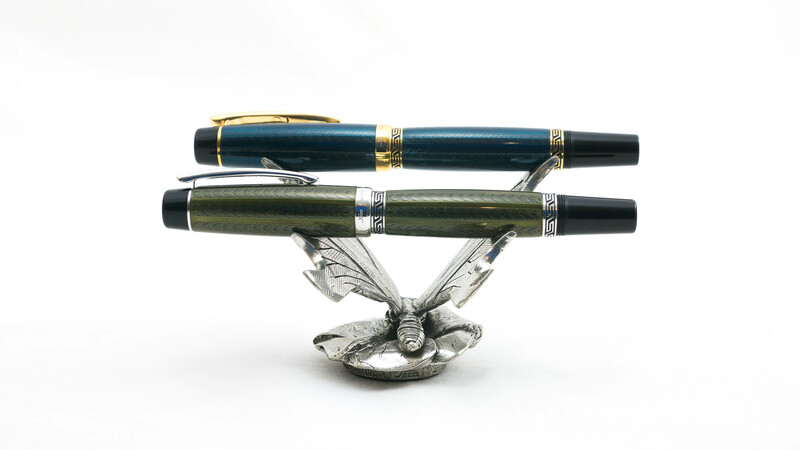 These pens will be given away on penhabit.com prior to the end of Season 5.